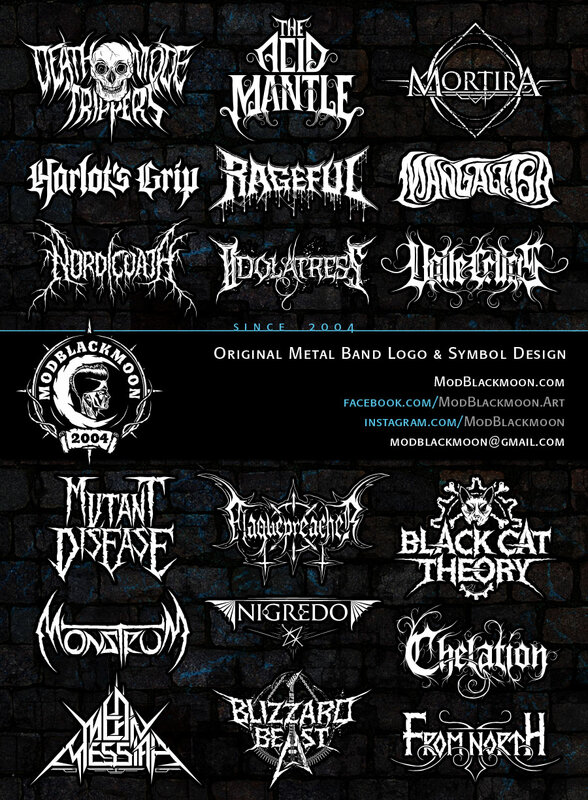 ﻿ ModBlackmoon | How to request a logo design for a Metal Band or Artist. How readable should it be? Should it be raw (with weathered edges) or smooth (clean edges)? Should it be spiked and hooked or plain and simple? Should the letters overlap, or they should have readable spacing? Should it be black and white or colored and textured, which effects u would like to see? Which filetypes would you prefer? Hi-res raster logo with texture effects (PSD, JPG, PNG - 6800px wide) or single color vector logo (PSD, TIFF, AI) which can be scaled to any size without quality loss. Or maybe both? Sometimes big projects take a lot of time to complete, because i'll keep you updated about the shape changes, so you'll be able to make any revisions. I spend this time because i respect your projects, but you gotta respect my time too and let me know about the changes in time, before i'll have to redraw a half of the design. A small note about Metal Logo design: Remember, I draw the logos manually, they are totally hand-drawn and i can't change the name when the shape is done. So, if you have a young band, be sure that you have the final bandname - because you can't just say "leave the style but type another words" - i can't type the new title in hand-drawing and i'm not gonna draw it again (you'll have to pay for a second logo in that case).